The Washington State Department of Fish and Wildlife intends to kill wolves in the Smackout Pack in Stevens County beginning this week to protect two ranchers’ cattle grazing on public land. The department’s intention is to kill members of the pack that has repeatedly preyed on livestock in Stevens County since 2015, said Jim Unsworth, the department’s director, in a news release. Wildlife department staff intend to kill the wolves using a range of methods, including shooting from helicopters, shooting from the ground and trapping. There is no set number of wolves to be killed; the goal is to change their behavior, to stop them from killing cattle, said Donny Martorello, the lead in wolf policy for the state, in an interview. The goal at this time is not to take out the entire pack. The department intends to assess results of incrementally killing the wolves before taking further action. The decision to start killing pack members is consistent with policy set by the state’s wolf-management plan set in 2011, and in particular, policy that allows killing wolves that prey on livestock three times in a 30-day period or four times in a 10-month period. That policy was developed last year by the Department of Fish and Wildlife (WDFW) and its 18-member Wolf Advisory Group, formed to represent the concerns of environmentalists, hunters, and livestock ranchers. Ranchers in Stevens County have borne the brunt of wolf recovery in Washington. Many ranching families there — with deep ties to the land, their animals and the ranching tradition — operate on slim financial margins, and have had to make unwelcome adjustments in their practices to continue ranching in what has once again become wolf country. Some ranchers have trouble even keeping their animals up in the forest because of wolf harassment, and those are lands their operations depend on. Ranching has been a permitted use on national forest lands, including the Colville National Forest, for more than a century. The state’s wolf policy calls for coexistence of wolves and people, including livestock producers, on the landscape. The Smackout pack is one of 20 wolf packs documented in Washington state by WDFW in 2016. 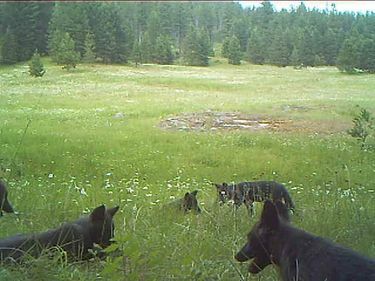 At that time, the pack was estimated to consist of eight wolves, but it has since produced an unknown number of pups. With four confirmed attacks on cattle since last September, the pack’s number is up, notes Don Dashiell, a member of the state’s Wolf Advisory Group and a Stevens County commissioner. “Let ’er go,” he said of the state’s removal effort. He said the state should take out half the pack now, and if that doesn’t work, keep going. The pack’s latest depredation on livestock was discovered Tuesday, when an employee of the livestock owner found an injured calf with bite marks consistent with a wolf attack in a leased federal grazing area. During the previous month, the rancher reported to WDFW that his employee had caught two wolves in the act of attacking livestock and the employee killed one of them. The killing of the wolf — a state protected species — is allowed under state law that empowers livestock owners and their employees to protect their livestock by killing up to one wolf in areas where wolves are no longer listed under the federal Endangered Species Act. The Smackout pack lives in the northeastern corner of the state, where wolves are not federally protected. Wolves began their return to Washington in 2008 after being hunted, trapped and poisoned to local extinction. They are a state-protected species all over Washington — with exceptions to protect livestock — and are federally protected only in Western Washington. The state’s wolf population overall is growing at a rate of about 30 percent each year. Wolf recovery remains a very low risk to cattle ranching. Most packs in Washington do not kill livestock, even when sharing the landscape with cows and sheep, and very few cattle are documented as killed by wolves. 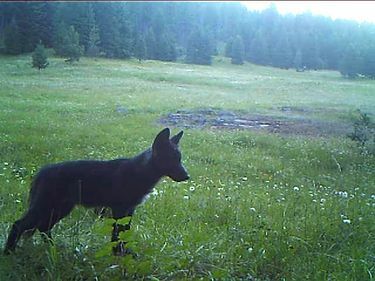 Since 2015, WDFW has documented that wolves have killed three calves and injured three others in the same area of Stevens County. Most cattle are lost to accidents and illness and other causes not related to wildlife. This is the fourth time the state has taken aim at wolves to protect cattle; it has previously targeted the Profanity Peak pack, the Wedge Pack and the Huckleberry pack. Mitch Friedman, executive director for Conservation Northwest, predicted more heartache as the state’s wolf population grows.